Inside A Style Blogger’s Closet: A Little BOGO 50% Off Sale Goes A Long Way! There’s always room in my accessories arsenal for some earrings (as seen in my various Instagram posts), which is why I have to share the latest BOGO 50% off sale on jewelry @Express. I’m crazy about the elegant & sophisticated fashion jewelry, perfect for day & evening, especially when there’s a coupon in hand. During my latest mall venture, I discovered & fell in love with the earrings below, which I already have lined up for very special outfits. 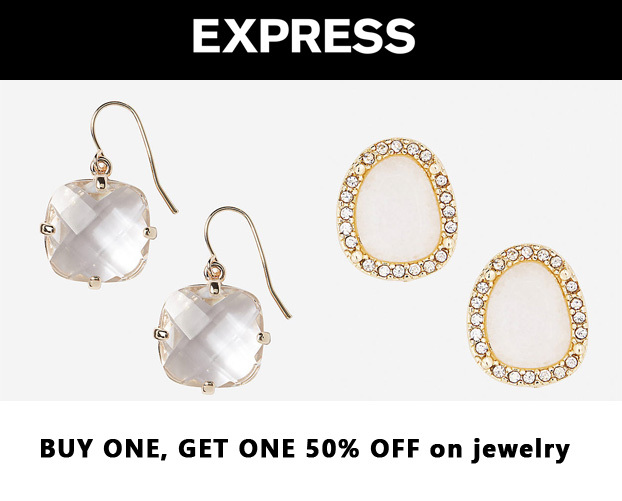 SHOP: faceted stone dangle earrings ($19.90) in shiny gold (also available in pale pink) & stone stud earrings with pave halo ($19.90) in white (also available in turquoise) @Express. While I love special, one-of-a-kind jewelry, I’m also a big fan of go-to piece when in a rush. What kind of jewelry do you like to wear over the summer? What sales are you shopping this season? Do you prefer gold or silver, or do you mix your metals? For more stylish posts, check out can’t-miss bargain wedges from Payless for $10, Chrissy Teigen’s menswear inspiration on the red carpet, the latest from The $100 Challenge, & Reese Witherspoon’s street style in her own Draper James separates. Happy Styling! This entry was posted in Accessories Access, Basics for a Bargain, Inside A Style Blogger's Closet, Quickie Darling Deal & Steal, Style Darling Daily, Style Tip and tagged accessories, Accessories Acces, affordable fashion, Basics for a Bargain, bling, Blogger, chandelier earrings, drop earrings, Earrings, Express, fashion, fashion blogger, Inside A Style Blogger's Closet, jewelry, musthave, pave, Quickie Darling Deal & Steal, sale, shopping, stud earrings, style, style blogger, Style Darling Daily, style for days, style tip. Bookmark the permalink. ← Show Me The Shoes: Summer Sale Must-Have Wedge Sandals for $10.00!